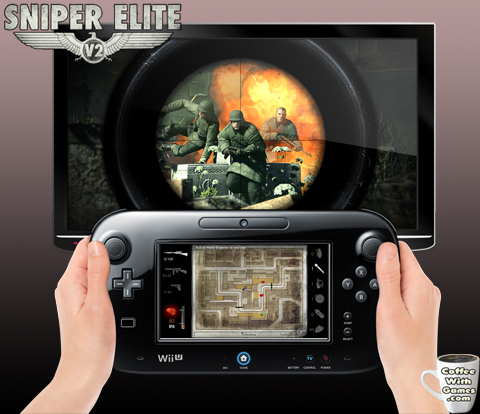 Coffee With Games: Interview: Sniper Elite V2 Wii U - What about the DLC and Miiverse updates? Interview: Sniper Elite V2 Wii U - What about the DLC and Miiverse updates? Excellent sniping spot! Behind the planes, behind a tank, and behind sandbags! 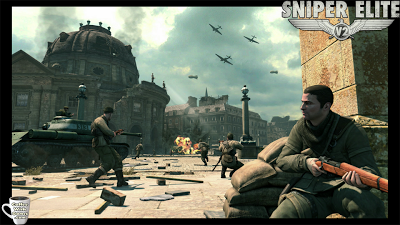 Sniper Elite V2 released a few weeks ago for the Wii U, and the description for the game on the Wii U's eShop says, "You are elite US sniper, Karl Fairburne, sent behind enemy lines into besieged Berlin during the final moments of World War II. You uncover a horrifying plot which threatens to kill millions of civilians throughout Western Europe, and which would irreversibly change history as we now know it. Make every single bullet count or the world dies with you." If you don't know, the game was originally developed by Rebellion and published by 505 Games for the PC, PlayStation 3, and Xbox 360 last year. The Wii U version currently has a MSRP of $59.99, and received an ESRB rating of "MATURE" with "Blood and Gore, Intense Violence, Language" listed as content for parents and gamers to be aware of. 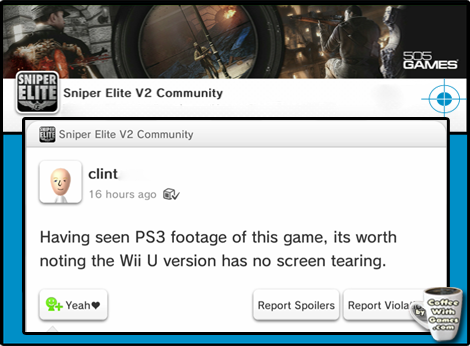 I reached out to Rebellion and 505 Games with some questions about Sniper Elite V2 on the Wii U, such as will the game be updated to allow in-game pictures to be posted to its Miiverse community? 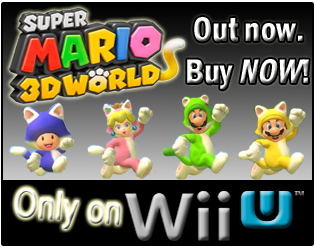 Also, what about the DLC for the Wii U version? I did receive answers to these questions about the game, and a few more as well, so brew yourself some coffee and hit the jump to learn more about Sniper Elite V2 for the Wii U! That's not a camera lens view, and I doubt they would say "Cheese!" 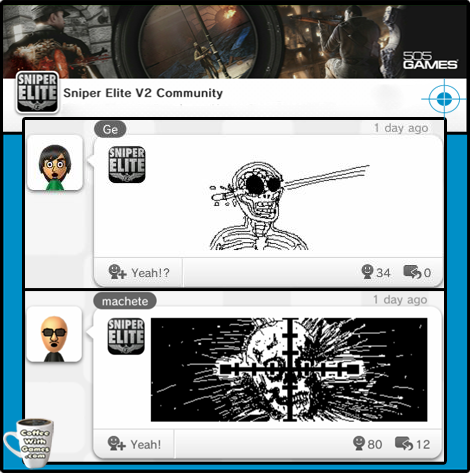 First up, Sniper Elite V2's Miiverse community is active. Right after the game released, I saw some comments about players not being able to take in-game pictures and post them to the Miiverse community, as well as some Wii U owners wondering if the game will receive the DLC found in the other versions of the game released last year. I asked specifically about the free multiplayer expansion pack that the PlayStation 3 and Xbox 360 versions have, and if there is any plan to make the DLC and online multiplayer mode(s) available for the Wii U version. 505 Games' answer was very straightforward about the DLC. They said, "We currently do not have any plans for DLC." What about updating the game to make the Miiverse in-game picture functionality work though, like basically every other Wii U game? This question (along with the next) was sent directly over to Rebellion, and their CEO and Creative Director, Jason Kingsley, answered it with: "With the game just launched, it's probably a bit early to talk about updates or new content yet!" So, until the game is updated to take advantage of the Miiverse feature for in-game picture posting (or, if it never is), Wii U owners will have to draw their own Sniper Elite V2 X-Ray Kill Cam shots to share with friends and other Wii U owners, to show the cool effect from the game. Some have already done so, as you can see in the two images below. Drawn by hand on the Wii U GamePad! While Sniper Elite V2 on the Wii U might be missing out on some of the content found in the other versions, I did ask which version the Wii U port was based off of and if the Wii U version looks and runs better than the other console versions. Mr. Kingsley replied, "We can't really go into specifics, but all versions of Sniper Elite V2 are running off our powerful in-house engine - Asura - which is very adaptable. We even use it to power our mobile games. The game also runs at a higher resolution on Wii U than it does on Xbox 360 and PS3 due to the platform's hardware strengths." Mr. Kingsley's statement about the Wii U version running at a higher resolution does seem to be backed up by some in the Miiverse community, and from at least one comment it seems the Wii U version does not have a screen tearing issue found in the PlayStation 3 version; or, at least not as bad/noticeable. I can sort of understand Rebellion not including the online multiplayer in the Wii U version, because the online community would probably be small (and it's apparently almost non-existent now in the other versions from what I have read). I do think that Miiverse can help solve some online community aspects in games though, with players finding other Wii U owners to hop into online matches from Miiverse. While they don't have any plans to release the multiplayer, co-op, or DLC for the Wii U version right now, I am glad to know that Rebellion took the time to make the Wii U version run at a higher resolution. 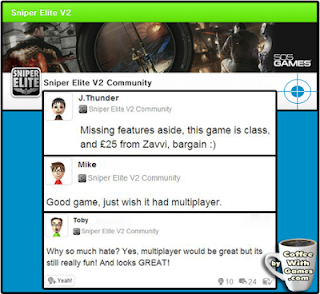 The day the Wii U trailer was released, I received a message from a friend who had not seen the trailer, and didn't even know that Snipe Elite V2 was releasing on the Wii U. I found his message and the timing of it pretty ironic. Why did I find it ironic? His message said that he was, "playing a cool Xbox game right now...V2 Sniper Elite." Again, he had not seen the Wii U trailer, and we had not discussed the Wii U version prior to him messaging me. He described the game in the message as, "Tenchu Stealth Assassins meets Call of Duty", and while I haven't played Sniper Elite V2 I have played the other games he mentioned. From some of the footage I have seen of the game and some of the comments I have read about the game since I received the message, I think his description of Sniper Elite V2 seems like a very good way to describe the game. I have not played the game, but I am interested in it, and I think I would enjoy the Off-TV play feature the most from what I know about it on the Wii U. I do hope that Rebellion/505 Games at least take the time to update the Wii U version to take full advantage of Wii U specific features though, such as posting in-game images to its Miiverse community, and perhaps even adding alternative and custom control options to the game. Have any of you had a chance to play Sniper Elite V2 on the Wii U, and if so, what do you think about the game? If you have played another version of the game, as well as the Wii U version, do you like the GamePad controls and the way they are implemented in the game? I see you were sourced on NintendoLife.com, excellent! I'm glad you reached out to the devs. I was curious about any future updates. I received my review copy a week ago and I'm having a great time with the game. I've seen the comparisons, and I can confirm it is a stripped down port. However, I can't miss what I never had (I never played the game on any other system), so I am enjoying what I do have in this cool single player game. I am totally enjoying all the sniping action, especially the X-Ray Kill Cam! Close quartered combat can be a bit tough, because it doesn't seem that there is any aiming assist feature (unless I missed it), so you have to press one of the trigger buttons to bring up your aiming reticule, then it's a piece of cake to take out the enemies. Perhaps you might reach out to Mr. Kingsley again in the future, encourage him to be more transparent with the fans of the game i.e. - go into more specifics :). I will not pay full price for a old game that's missing key content (DLC) and features (Multiplayer). dumb move not to include multiplayer or dlc, which is available in all the other versions, along with a 60$ price tag. 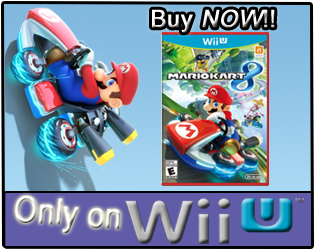 and publishers wonder why their games aren't selling on the wii u. "...so I am enjoying what I do have in this cool single player game." Yeah, my friend has the 360 version, and he doesn't pay for XBOX Live, and was just enjoying the single-player aspect of the game. Thanks for the comment and feedback on your time with the game, and I'll be watching for the review! "I think the controls on the Wii U look interesting - definitely different." I have read that the touch screen weapon selection is a nice improvement, to being able to quickly select/change out your weapons. As for having more a more 'traditional' control setting though, I'm surprised the game didn't offer a Wii U Pro Controller control setting at the start. I would imagine that would have been a pretty simple thing to add to it, and less time to program in than the GamePad stuff? What would be your "magic" price? Just curious, because I take it you may be interested in the game, but just wanted the extra content and/or a lower price? Have you by any chance played the other versions of it, or know anybody with them? When I was putting this together, the comments I was reading were saying the multiplayer mode(s) in the other versions was/is very sparse with players now, so I would be interested to know if there are any players that play the modes quite often on them. Like I asked Donman1, if you're interested in the game, is there a price that would have made you more likely to grab it already, despite it not having the other content? How can we contact Rebellion directly? It would be a huge help if we could get our message directly to their in-box. Half-assed ports with lacking features and less DLC is not how third parties are going to make money on the Wii U.
Nintendo gamers expect BETTER than that. But, they are aware of this post as well, and there will be one more later this week on it. But im not going to pay full price for half a game.... and not even miiverse screencaps? I will grab this when it hits 30 bucks or less, used, or even an eshop sale. Im sure it will be quite the fun single player experience. I do hope they update the Miiverse features, as this is the only Wii U game that I'm aware of that doesn't have it. Other "MATURE" rated Wii U games have it, such as Resident Evil, ZombiU, and Call of Duty, so I'm not sure how they missed it when porting the game over. I always try to finish the single player campaigns in games that offer any sort of online multiplayer, and I am interested in the single player here because of what my friend has said about it. I do hope 505 Games sees the feedback on this one, and can use that for future Wii U games.